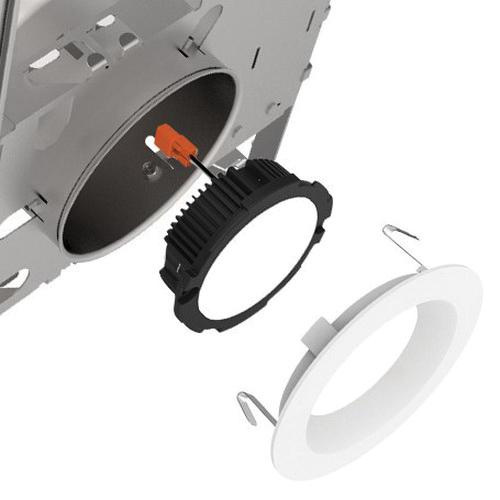 DMF Lighting New construction 6-Inch LED recessed downlight housing in white flange finish, features die-formed steel construction. This round housing has 14.7-Watt 93+ CRI 750/1000-Lumens 2700K/3000K/3500K/4000K LED lamp that has voltage rating of 120/277-Volts. It is 1/2 - 1-Inch insulated air-tight ceiling mountable. It has cut out of size 6-3/8-inches. It measures 24-Inch x 11-Inch x 7-1/2-Inch. Housing comes with six 1/2-Inch and one 3/4-Inch knockouts and pryout slots to allow straight conduit runs. Junction box tension spring permits snap-in installation of plate cover for easy access to wiring. Preinstalled adjustable bar hanger accommodate lumber, laminated beams and T-bar. Housing is cULus listed, Energy Star certified, IC rated, RoHS compliant and meets ASTM standards.